If you’re not a car enthusiast, washing your vehicle can sometimes feel like a massive chore. Hoppy’s Carwash & Café locations allow you to sit, relax and enjoy a delicious coffee, while we wash your car for you. Plus, on those hot Gold Coast and Brisbane days, you can take it easy in our air conditioned café while we take care of your full service hand car wash.
Hoppy’s Cafés strive to provide each and every one of our Gold Coast and Brisbane customers with a quality, friendly service. All of our cafés are designed to suit our customers busy lifestyles, and offer the perfect environment to get your car hand washed while you wait. We make cleaning your car simple and easy to-do, letting you enjoy a delicious coffee while your car gets an excellent hands-on clean. Perfect for those busy mornings, now you can drive in for your morning breakfast and caffeine fix and drive away clean. Don’t let those hot summer days or cold winter afternoons get you down, our temperature controlled cafés are comfortable, delicious and conveniently located. Stop in for breakfast or lunch and get a full-service hand car wash while you enjoy your meal. At Hoppy’s, we make getting your car washed a stress-free, convenient stop along the way, letting you take a peaceful café moment before getting back on your way. Our Brisbane and Gold Coast café locations offer a great selection of food and drink menu options, ensuring that there is something to suit everyone’s tastes. And yes, we even offer specialty milks, like almond milk and soya milk for your coffee! Our dedication to delivering a friendly, quality service during your café visit, makes us a first-choice location across Queensland’s East Coast for your next hand car wash and car detailing service. Four of our conveniently located full-service hand car washes also offer dog wash bays, so now you can enjoy your morning cuppa at our outdoor café tables next to your freshly cleaned pup. Plus, our wash menu includes detailing options, to help make pet hair on your interiors upholstery and carpet a thing of the past! It truly is a one-stop-shop for all of your car washing, pet washing, coffee and food needs, and we have endeavoured to make all of it as easy and worry-free for you as possible. 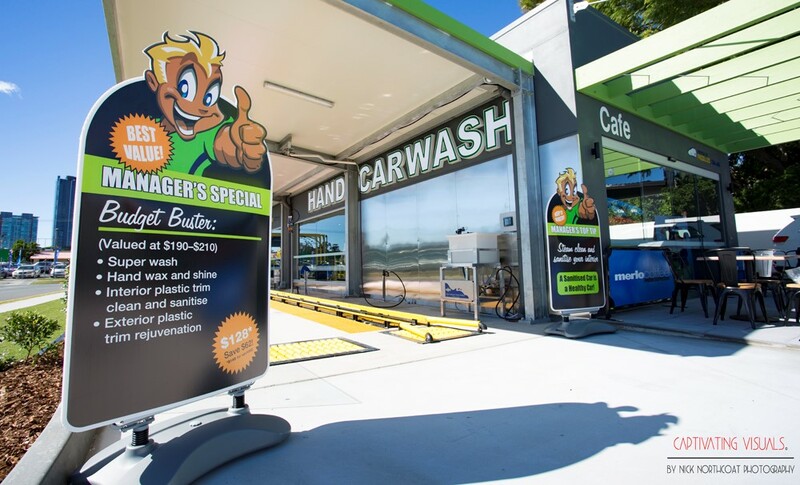 Visit Hoppy’s Carwash & Café at Bowen Hills, Toowong, Norman Park, Mermaid Beach or Southport for a café experience and a hands-on car wash that you’ll come back to every time.